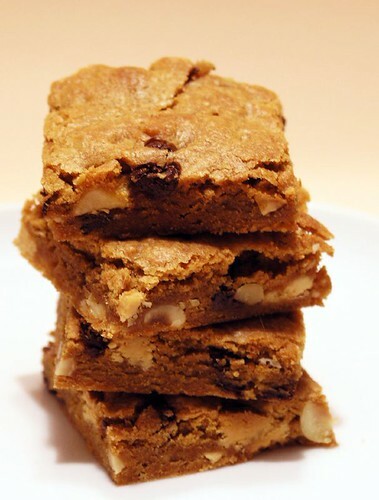 I made these wonderful little blondies a few days ago, and I won't even bother to tell you how good they were, because it'll won't take you more than half an hour to whip up your very own batch. Go! Go! I found this at Smitten Kitchen - thank you, thank you, thank you. I added about 50 ml (that's a little more than three tablespoons) each of dark and white chocolate, and 100 g of toasted hazelnuts. Heat the oven to 175°C, and butter a small oven pan, about 20*20 cm. Mix the brown sugar with the melted butter. Add the egg and vanilla. Stir in salt and flour, and any add-ins you'd like. Pour this into the pan, and bake for 20-25 minutes - it should be a little gooey when you pull it out. Freezes very well, re-heats perfectly in the microwave, and for real decadence, serve with some whipped cream and possibly a few berries. Det är farligt och skriva en så lång lista med godsaker man kan stoppa i, jag har en tendens att vilja ha med allt! I think I made a similar comment when Smitten Kitchen made them- they're way too easy and therefore very dangerous! Delicious! Mums. Och så lätt det ser ut att göra dom. Hmmm ... det är bättre när det är svårt att göra kakor för då frestas jag inte så lätt. Gott, gott. i made these - great stuff! thanks~! I made these and they were absolutley wonderful! These cakes are very tasty! Bravo for your nice blog !